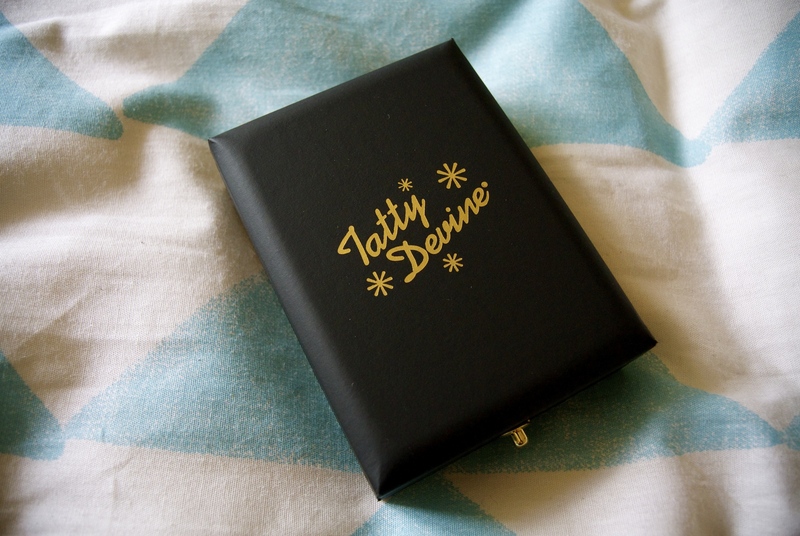 My love for Tatty Devine has already been documented on this blog on a number of occasions. I would buy pretty much everything on their website if I could. Last year, I missed out on the sample sale and lucky dip weekend – I think I might have been on holiday or away for work or something – but this year, I was able to jump online as soon as the boxes went online. YES! I was super excited when the box arrived, because I am a ridiculous dork. Ooo, it’s a good’un. 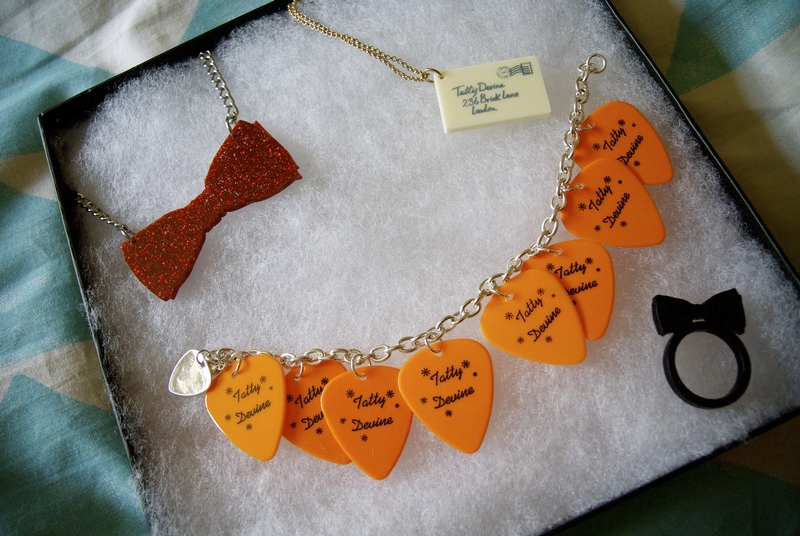 Awesome red glittery bow tie and matching ring, Tatty Devine postcard and plectrum bracelet. A plectrum bracelet, man that’s good! I remember being obsessed with their plectrum jewellery years ago but couldn’t afford it as a Young Person. Now I finally own some! Tatty Devine will run a swap shop on Facebook once everyone has received their boxes, and I’m tempted to have a look, maybe for the ring as I’m not really a ring person, but I’m equally happy keeping it all. I only bought one box, which I am regretting this a little. The other box in the photo was a little gifty Husband bought me last week. 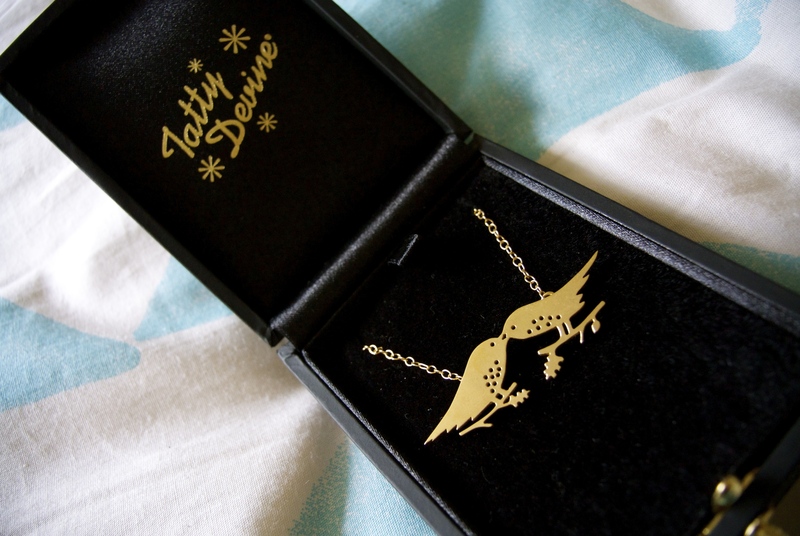 A STUNNING gold Rob Ryan Each Kiss necklace. I actually screamed when I opened the box. Oh my goodness, I love it. And bonus present – it came with a limited edition Rob Ryan print, signed by Rob, Harriet, and Rosie. I need to find a frame for it and put it straight up because it’s so gorgeous. There’s a sample sale at Tatty Devine next weekend, and it’s a good job that I’m going to be in The North because I really need to stop spending money on jewellery now.